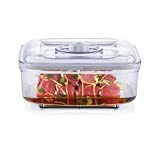 What Makes The Best Marinating Container? Marination is one of the best ways to flavor meat before cooking it. In addition to being easy, it is an effective way to tenderize tougher cuts. The typical marinade consists mostly of an acidic ingredient like vinegar or citrus juice, along with a little oil and some spices. Marination is effective for all types of meat and for tofu as well as for some vegetables. When handling and preparing raw meat, food safety is one of your greatest concerns. Marination takes time, which means that you will have to store the food while it marinates. Storing raw meat at room temperature on your kitchen counter is out of the question. Marinated meat will have to be stored in a refrigerator and steps must be taken to prevent cross-contamination. All of this makes the choice of container for your marinated meat very important. Just because a container is the right size and will fit in your refrigerator, does not make it the right choice for storing marinated food. Let’s break down the dos and don’ts for choosing the best marinating container for not only safety, but also freshness and flavor. Do choose a container with a secure seal. This can help to prevent messy spills and keep airborne bacteria from contaminating other foods in your refrigerator. A container that seals tightly will also keep other foods in your refrigerator from taking on the smell of your marinade. This is important since marinades often contain aromatic spices that can easily be absorbed by uncovered foods. 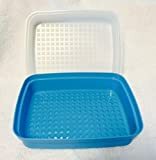 If you are grilling away from home and plan to transport the food, a tight-sealing lid can also make marinated food easier to transport. Use a flat-bottomed container for marinating meat. This ensures that the meat lays flat and is fully and evenly exposed to the marinade. Do use a container made from a nonreactive material. The material used to make the container plays a major role in food safety. Certain materials are suitable for marinating meat, others less so. The issue is similar to that faced when curing meat since curing salt reacts with some materials but not others. You will have to choose a container that does not react with acids in the marinade. The best materials for a marinade container are food-grade plastic, stainless steel, and glass. Self-sealing plastic bags are great since they have an airtight seal and you can simply dispose of them after use. When using the plastic bags, press down on the bag to remove air before sealing. Do choose a container that is the right shape and size to fit on the bottom shelf of your refrigerator. If the worst does happen and the container does spill or leak, there will be nothing underneath it to be contaminated. Don’t use containers that are too small for the amount of meat you are preparing. If meat is too tightly packed into a container, all of its surfaces may not be exposed to the marinade and it may not absorb enough of it. Don’t use aluminum containers. The issue with aluminum has more to do with flavor than with safety. The reaction of the metal with the acids in the marinade can ruin your meal by changing the flavor and color of the meat.